Civil Beat's list of candidates on the Aug. 9 primary ballot with links to their questionnaires (as they become available) and other information. If you’re looking for our general election ballot with its links to candidates’ Q&As, click here. Hawaii is the only state that holds its statewide primary election on a Saturday. This year, the primary was Aug. 9. 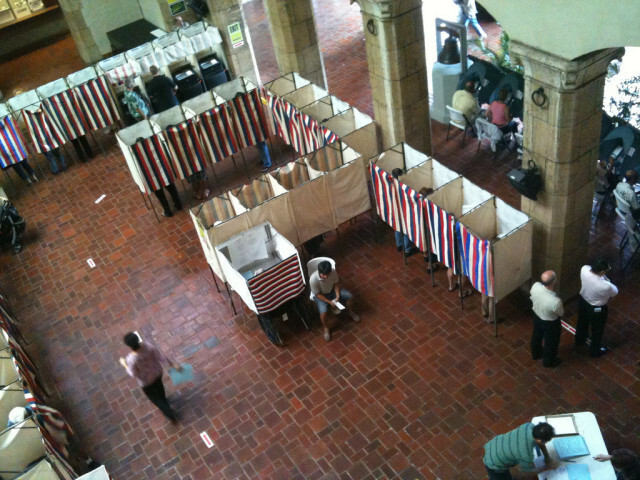 Voters at Honolulu Hale, 2010. The governor and lieutenant governor are up for election in 2014. So is one U.S. Senate seat and both of Hawaii’s U.S. House seats. Every state House seat — all 51 — will be on the ballot this year along with 13 of the 25 state Senate seats. (See list below). So will four of nine Honolulu City Council seats, the mayors of Maui and Kauai, and county council seats in Maui, Kauai and Hawaii County. Five of the nine seats on the board of trustees for the Office of Hawaiian Affairs will also be on the ballot — three at-large seats, one representing Oahu and one representing Maui. Candidates who won their primaries and had no general election opponent are deemed to have won the office. In Hawaii, many races are effectively decided in the primary because of the overwhelming dominance of the Democratic party. Here’s a list of the seats — and candidates who have filed their paperwork to run for office in the primary. Some candidates have been active for months, including raising money from contributors. Check back frequently: We’ll be updating this page to include links to information on candidates and where they stand on important issues. Civil Beat will be sending out candidate questionnaires in statewide and legislative races as well as Honolulu City Council races. We’ll link to those from this page as they come in. For the unofficial general election ballot click here.